This preservative free sauce is good for adding beautiful glaze to a dish. It can also be used as dipping sauce to fried chicken, tofu and seafood. 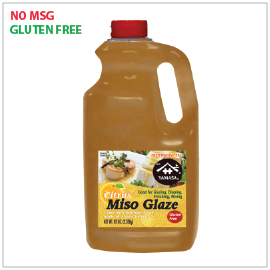 Sugar, Miso (Soybean Paste), Water, Corn Syrup, Gluten Free Soy Sauce (Water, Salt, Soybeans), Orange Juice Concentrate, Ginger, Lime Juice Concentrate, Vinegar, Modified Starch, Yuzu Juice, Salt, Citric Acid, Yeast Extract, Xanthan Gum. 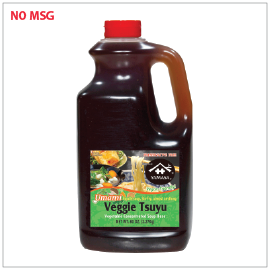 Preservative free and umami packed tsuyu, this vegetable concentrated soup base is great for vegan soup dishes such as ramen, udon, soba and more! Soy Sauce (Water, Wheat, Soybeans, Salt), Water, Corn Syrup, Sugar, Salt, Vegetable Extract Powder, Yeast Extract, Kombu Extract Powder, Mirepoix Powder, Shiitake Extract Powder.